This Saturday we were able to see, with complete clarity, what that other politics is. The caravan from San Cristóbal, with dozens and dozens of vehicles of all sizes, was a serpent of many kilometers. 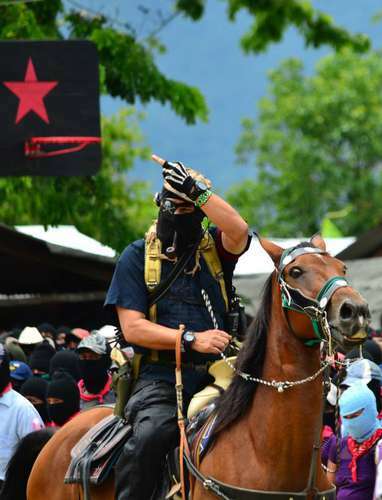 After the very long trip, not immune from tension and tribulations, they arrived in La Realidad, a teeming reality of Zapatista support bases that had arrived from everywhere to defend what is theirs and to show the vigor of the response. The Caracol’s esplanade was filling up little by little. When no one would fit any longer and the sun began to shrink, Subcomandante insurgente Marcos appeared on horseback. On his left hand he wore a black glove with bones painted in white. Instead of his usual weapon he was carrying a machete on his back. Subcomandante Insurgente Moisés and Comandante Tacho arrived next. All of them, the milicianos as well as the insurgents and the comandantes, wore the right eye covered; so that we could imagine how the world is seen from the left. The voice of Sup Marcos greeted everyone from Radio Insurgente. Subcomandante Moisés next reported about the results of their investigations of the attack on La Realidad and the assassination of Teacher Galeano. He asked not to fall into the provocations of the paramilitaries. Tacho as well as Moisés insisted that the Zapatistas do not seek revenge but justice. The indignation and rage have to be directed against the capitalist system and its political expressions, not against those confused brothers that let themselves be bought and manipulated by the government. In the afternoon, we listened to the words of the Indigenous Revolutionary Clandestine Committee- General Command of the EZLN (Comité Clandestino Revolucionario Indígena-Comandancia General del EZLN), in the voice of Comandante Tacho. The communiqué, read by Subcomandante Moisés, described in every detail the links between the paramilitaries of the Cioac-H and the government of Chiapas and the chains of relationships and complicities that involve municipal presidents, governors and ex governors. He also related the series of harassments and armed attacks that that same organization has carried out recently against the Zapatistas. Finally, everyone sang the Zapatista Hymn and a long and moving procession was organized to visit the tomb of the teacher Galeano. A little later, the complete audio of the communiqués and the information began to circulate through the free media. While this was occurring in La Realidad, in more than a hundred cities in Mexico and the world the creativity and entirety of those who shared the pain and rage of the Zapatistas for the atrocious assassination of Galeano was demonstrated publically and transformed into organization and mobilization. Ten years ago, Arundhati Roy anticipated what is happening: “Not only is another world possible,” she pointed out “it is underway. If one listens with attention on a quiet day, one can hear its breathing.” This Saturday, in La Realidad, we entered it. It is already among us. The thing is to multiply it everywhere, in its thousand different forms. That is, very concretely, what is now being attempted. Adherents to the Sixth (la Sexta), students of La Escuelita, and the millions in Mexico and in the world that continue finding in the Zapatistas a source of inspiration, seem decided to employ these dates as un detonator similar to that of the Uprising. We’re dealing with a new cycle of organization and mobilization to resist, stop the horror and to practice, each in their way, in their place, the new forms of doing politics. Today, like yesterday, we’re also talking about defending the Zapatistas and Zapatismo as a political initiative, at the side of Subcomandante Insurgente Galeano.